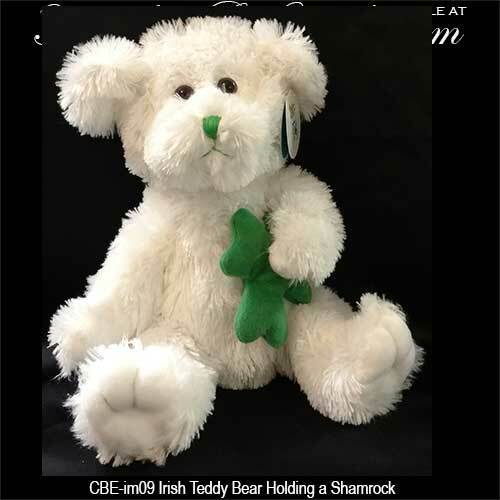 This Irish Teddy Bear would make an ideal St. Patrick's Day decoration. This plush Irish Teddy bear is holding a green cloth shamrock in his paw and is enhanced with an embroidered green nose and mouth. The stuffed Irish Teddy bear is 12" long and has a bean filled bottom area. 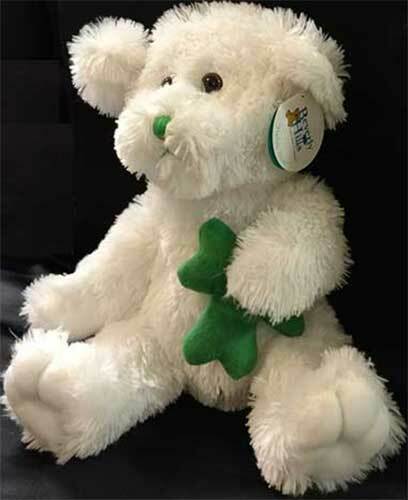 This cuddly stuffed animal is complete with a shamrock history card, complements of The Irish Gift House. Irish Teddy bear features a soft plush design that is enhanced with an Aran sweater along with an embroidered shamrock on his paw.